The Gold Medal for “Innovation” in daffodil breeding was presented by Brian and Betty Duncan of Northern Ireland to the American Daffodil Society on the occasion of the 50th Anniversary Convention in Washington D.C. April 2004. The Innovation Gold Medal is to be awarded for the most innovative new daffodil exhibited at the American Daffodil Society’s National Show. The winning variety should demonstrate significant novelty, advance or break-through qualities which could be expected to influence future development of the genus for commercial or exhibition purposes. 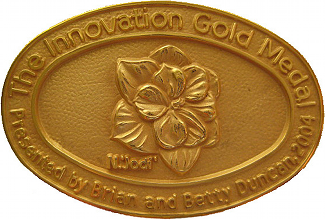 The Innovation Gold Medal will be available for award at the annual National Show at the discretion and unanimous vote of the President’s selected panel of expert judges. Here is the criteria used to judge daffodils for the Innovation Award: Judging Criteria for Innovation Medal. Here is the list of Innovation Medal Awardees in a 8 ½” x 11″ printable format: Innovation Medal Awardees. The Panel is selected by the President. The Panel should consist of not less than three and not more than five members. For Award of the Medal, the voting of the Panel should be unanimous. Panel members should be chosen from established and experienced daffodil breeders, growers or exhibitors who are well versed in current daffodil developments throughout the world and who happen to e present at the Convention. Panel members must not feel obliged or allow themselves to be pressured to vote for the Award of the Gold Medal if in their opinion, candidate flowers do not meet the stated criteria. If a flower raised by a panel member has been selected as a candidate for the Award he/she must immediately declare an interest and stand aside. Likewise a close relation, employee or very close associate should volunteer to stand aside. It must be exhibited at an ADS National Show and Convention, either in competitive classes or in Bulb Nursery or private displays. It must be “new” in that its name has not been registered more than 5 years previously. If an unregistered seedling is chosen for the award the breeder/stockholder must undertake to register it as a cultivar with The Royal Horticultural Society as soon as possible after the judges announce their decision. Ideally, a name would be chosen before the end of the Convention, perhaps from a suggestions box placed in front of the Award winning bloom on the honors table. Join us in Bloomington, MN on May 2-5, 2019 for our ADS National Convention! Refer to the 2019 National Daffodil Convention page for details. Subscribe to our Newsletters to receive up to date information about our programs and events!